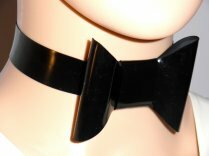 Minamalist Choker, smart and elegant. 3 bar clasp at the rear. Compliment you dress with this simple accessorie. Wide choice of colours available for you to choose from.